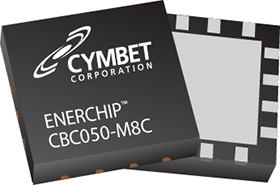 The EnerChip™ CBC050 is a surface-mount, solid state, rechargeable energy storage device rated for 50µAh at 3.8V. It is ideal as a localized, onboard power source for SRAMs, real-time clocks and microcontrollers which require standby power to retain time or data. It is also suitable for RFID tags, smart sensors, and remote applications which require a miniature, low-cost, and rugged power source. For many applications, the CBC050 is a superior alternative to coin cell batteries and supercapacitors. Because of their solid state design, EnerChip™ storage devices are able to withstand solder reflow temperatures and can be processed in highvolume manufacturing lines similar to conventional semiconductor devices. There are no harmful gases, liquids or special handling procedures, in contrast to traditional rechargeable batteries. The EnerChip recharge is fast and simple, with a direct connection to a 4.1V voltage source and no current limiting components. Recharge time is 20 minutes to 80% capacity. Robust design offers thousands of charge/discharge cycles. The CBC050 is packaged in an 8 mm x 8 mm quad flat package. It is available in reels for use with automatic insertion equipment. powered, low duty cycle applications. and other devices alert in standby mode. system during exchange of main batteries. with energy transducers such as solar panels.